The American Products American Power bus tour kicked off in Dallas, TX on Tuesday. Former radio talk show host Michael Reagan spoke to the crowd about the importance of domestic energy production and manufacturing. Mr. Reagan quipped that to meet Californians he has to travel to Texas, because the regulatory environment in California has driven businesses out of the state. Michael Reagan’s dad, the President Ronald Reagan understood that one of the biggest threats to prosperity was an overreaching federal government. We’re thankful that Michael continues to fight and carry the torch for free markets and prosperity. The bus tour rolled out of Dallas after a great morning with Mr. Reagan, ready to travel the country for the next six weeks and connect with concerned citizens about the importance of energy and the economy. On Tuesday evening, the bus tour was greeted in Hobbs, NM by the Economic Development Corporation (EDC) of Lea County. Munching on bacon-wrapped jalapeño peppers, local industry leaders and the AEA team discussed the importance of the bus tour and the fight for freer markets with New Mexico State Senator Gay Kernon. If only the regulatory environment in this country was as hospitable to business as the EDC was for the bus tour, our economy would be flourishing. 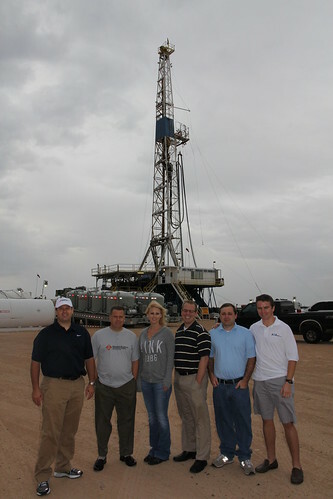 Following the reception in Hobbs, the AEA team made a quick stop at an oil drilling operation on Highway 529. The crew operating the rig was hard at work, so after a few photos we continued to cruise towards Artesia, NM for a rally with the Mayor and hot dogs cooked by the local radio station. 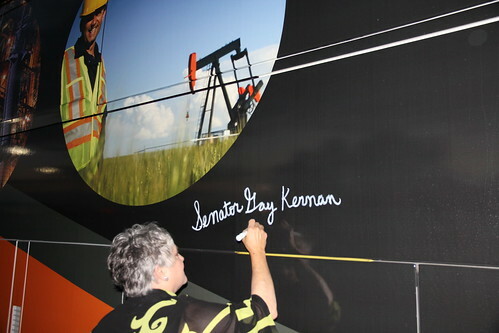 Signatures continued to fill the side of the bus in support of affordable, reliable energy. The Chamber in Artesia was the perfect backdrop for the rally, nestled adjacent to the Navajo Refinery. The facility has a crude oil capacity of 100,000 barrels a day, the largest in New Mexico. State and federal regulations and taxes are making it more difficult for refineries like these to continue to be the lifeblood of the economy. Click here to hear the Mayor of Artesia discuss the importance of the oil and gas industry for not only their local economy, but the entire nation. On Wednesday afternoon, the American Products American Power bus drove in the Lovington Parade for the opening day of the Lea County fair. Sandwiched between heavy-duty hydraulic fracturing equipment, parade floats, and horses, thousands of people cheered and saluted as Lee Greenwood’s Proud to be an American blared from the American Products American Power bus. After the parade, the AEA team sat down with Congresswomen Heather Wilson and Senator Gay Kernan for ice cream and sodas at the Main Street Cafe to cool down. The Honorable Heather Wilson, currently running for U.S. Senate, noted that today it takes 120 days to get permit approval to drill on BLM land in New Mexico, whereas in 2006 businesses only needed 60 days to work through the permitting process. Now more than ever, the bus tour and the American Energy Alliance’s fight to push back against costly regulations and red tape is crucial to reigniting the American economy and maintaining the strength of the local economy in New Mexico. On Thursday morning, the crew held a rally in Roswell at the local chamber of commerce. The bus was greeted by great enthusiasm from local residents and business leaders who came out to hear our message and express their support of our efforts by signing the bus. This afternoon the bus is rolling up to Albuquerque, NM to attend a conference with the Independent Petroleum Association of New Mexico, where the attendees will view a screening of “spOILed” featuring Senior Vice President of the American Energy Alliance, Dan Kish. Check out this page to see if the bus is coming to your town.